Anzac day has always been met with a great sense of pride, respect and passion in my house hold, not just because I am the wife of a serving member but because I come from a long line of serving members and it's in my blood! My father was a Navy man, His father also served in the RAF before migrating to Australia. Both my father's brothers served, one in the Army (whom continues to serve in the reserves) the other in the RAAF, even one of his sister served briefly in the Army. My husbands father served in the Army, as did his father and his fathers brother. Ron had the honour last year of marching along side his father wearing his grandfather medals, and the feelings surrounding that momentous event was indescribable. 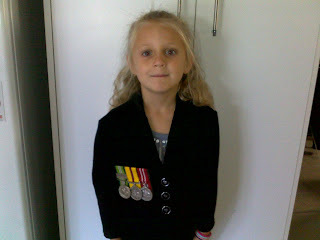 So there is a long line of history when it comes to our family and Anzac Day, and the kids love watching there father march and take great pride in the days events. It honestly wouldn't surprise me if at least one of my children became serving members themselves. We as a family had a rather quiet Anzac Day this year (which is rather unusual in itself ) but then again Anzac Day is a time to remember rather than a time to get rolling drunk and stagger home. After Ron's initial dawn service we spent the morning lazying about home researching and reading Ron's grandfather's Defence documents and enlistment paper work, spent sometime at the park as a family, and enjoyed a lovely lunch with close friends at the local League's club. Being new to Sydney we weren't really clued up on what was on and honestly the kids and I didn't actually expect Ron home at all, so it was nice to spend it together as a family for once. Hope everyone else had an enjoyable Anzac Day.